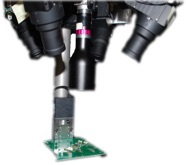 ASTRI’s 3D machine vision (3D Solder Paste Inspection, SPI/ 3D Automated Optical Inspection, AOI) adopts digital fringe projection technology to develop a fast and highly accurate 3D micro meter grade vision system. It can significantly improve the failure detection rate especially for false soldering in Surface Mounted Technology (SMT) process. The major innovations of the project are (1) shadow-free multiple projection system configuration, (2) multi-frequency fringe modulation, and (3) super fast multi-way phase integration. High Resolution Digitalised Strip Patterns with Delicately Calibrated Exposure Time to Perfectly Overcome Blind Spots caused by Reflection. Four-Angel Projection Design for the AOI System to Minimise the Shadow Area. Efficient Algorithm with High Accuracy with Depth Information covering all the Pixel Points on the whole PCB Board to Detect Defects on all kinds of Components and Leads.